This Port Jackson oval wall mirror functions as a stunning detail when displayed in any space. The vertical design of this Port Jackson oval wall mirror will stand out as a charming detail in any living space. The antique silver finish refines the design of this mirror with neutral beauty. The metal frame accents the mirror beautifully. 22" wide x 40" high x 1 1/2" deep. Hang weight is 16.5 lbs. Glass only section is 20" wide x 38" high. Surrounding frame is 1" wide. Port Jackson oval wall mirror. Antique silver finish. Metal frame construction. 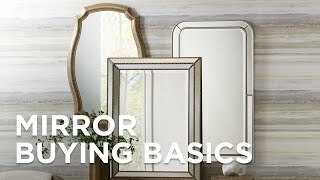 BEST ANSWER: No, the mirror is not beveled. Petra Antique Silver 24 1/4" x 48 1/4"
This elegant large generously beveled oval wall mirror with an antiqued silver leaf finished frame can be hung horizontally or vertically to suit the decor.